We’re used to thinking of ourselves as smarter than other animals, but sometimes it looks like even chimpanzees can outsmart us. 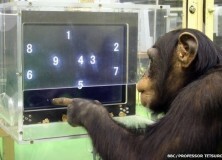 A while ago, Justin Quillinan and I set up the Chimp Challenge. We were interested in a study by Inoue & Matsuzawa which demonstrated the amazing visual processing abilities of a chimpanzee named Ayumu. Ayumu played a game where he saw 9 numbers flash on a screen for 210 milliseconds. Apparently, he has no problem in remembering he location of each while humans find this very difficult. Now you can try this game for yourself at an interactive exhibit in Edinburgh Zoo. Get yourselves along to the Living Links site at the zoo and help us find out more about this phenomenon. Maybe you can beat Ayumu’s score?